Pluck. Spirit. Gumption. The will to press on and shake your fist at the Universe and have the audacity – to laugh. I’ve come to believe that laughter is the ultimate sedition. Who are we to laugh in the understanding of the world’s capacity for cruelty, for suffering and for pain? In the wake of the tragedy in the historic Charleston church yesterday, I’m struggling with the immense sadness that looms above America at this moment. Our own sadness started earlier this week at the ranch. We lost our darling goat Chocolate. For eleven years, she touched lives with her naughty antics ranging from jumping on the hoods of cars, to pulling the leg hairs of men brave enough to wear shorts around her. She ripped wiring off of trucks, ate the lunches of hundreds of children, she wrestled and burped and head butted her way into countless photos and into our hearts. 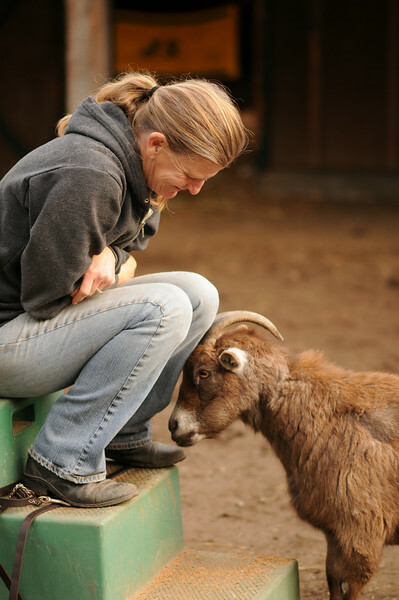 She was so wonderfully, unapologetically alive for every visitor to Square Peg Ranch. It’s hard to embrace the knowledge she will never be here again to make us giggle. You can’t compare the two losses of course. Nine human lives taken with rapacious violence as opposed to the somewhat peaceful passing of a pet who lived a joyous and long life. But loss is loss and helping our families work through death doesn’t always leave time or space for staff to process their own feelings. It’s healthy to grieve. Death and suffering give us a perspective from which to think about what is important and what is superfluous. Facing the suffering of others and being helpless to change it is part of what makes us human. It opens our hearts and connects us to both the suffering and the joy of our humanity. But it’s easy to get stuck in the rut of sadness. It’s tempting to perseverate on the immense capacity for cruelty we see through the news. It’s a slippery slope to delve into the meaninglessness of the loss of what was alive just moments ago – is lost forever. I came across a meme the other day that said “Expectations are just disappointments in training.” I laughed. Because Pathos and Irony are the truest forms of humor. And in the next moment, I came across a badly produced music video of singing and dancing and I unexpectedly found myself in tears. I’ve got a million things on my plate – scores of families reaching out and needing and deserving our help. Bills that must be paid, meetings attended, chores completed. I can feel the weight of my to-do list pressing on my chest and shoulders, shaking me awake and demanding an earlier start, a longer work day, a more focused effort. And yet, I sat myself down to write and grieve and honor the part of me that needs a quiet moment to sort out not just the “how” of running a space of love and acceptance, but to remember the “why.” What I really wanted to do, was to figure out “why” the music video made me cry. Then I remembered something I’d read years ago and I’ll share part of it with you now if I may. It’s a snippet from William Faulkner’s Nobel speech in 1949. As we process the tragedy of the Charleston massacre yesterday, let us honor the dead by truly living. Let us show our humanity by writing the poems, singing the songs, dancing the dances and let us show our immortal spirit by being brave enough – to be silly enough to laugh.